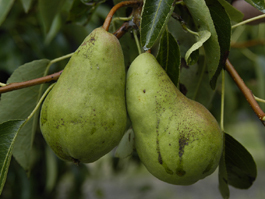 Pear psylla probably arrived in the United States along with shipments of pear nursery stock from western Europe. It was first found in Connecticut in 1832 and spread to Washington State by 1939. Within a few years it became a serious pest throughout all pear growing areas in the Pacific Northwest. 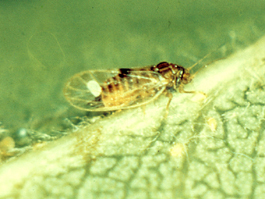 As well as causing fruit russet, serious infestations can stunt, defoliate and even kill trees. In the Pacific Northwest, pear psylla is a pest only of pear. Pear cultivars vary in their suitability as hosts and, to a greater degree, in their susceptibility to damage from the honeydew. In general, russeted cultivars, such as Bosc, sustain less fruit damage than smooth skinned pears. Red pears are less suitable hosts because they are generally less vigorous, and Asian pears are less prone to infestation than those of European origin. 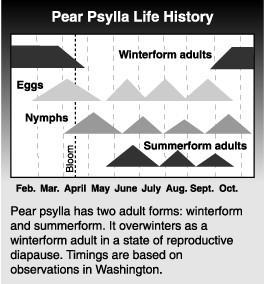 Several other plants serve as transitory hosts and overwintering sites for winterform pear psylla adults. The psylla may feed on other deciduous fruit trees, especially apples, as they disperse from pear orchards in the fall and return in the spring. However, pear psylla does not reproduce on these transitory hosts. All stages have two conspicuous red eyes. The egg, shaped like a grains of rice, is attached to the host by a small protrusion extending from the rounded end. A curled filament extends from the pointed end. The egg is creamy white when laid but turns yellow to orange as it develops towards hatching. 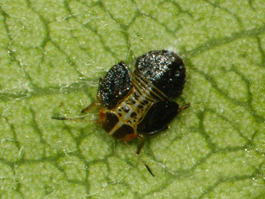 The nymph passes through five instars, each of which ends in a molt. The first instar is creamy yellow. It is long, cylindrical and about the size of the egg. Each successive stage is larger, flatter and more oval than the last. The fourth instar nymph is yellow-green to light tan, while the fifth instar is dark green to dark brown. Third, fourth and fifth instars have progressively larger wing pads. There are two adult forms: winterform and summerform. The winterform adult measures about 1/10 inch (2.5 mm) long, whereas the summerform is only 1/12 inch (2 mm) long. Wings of both forms are held roof-like over the abdomen. Winterform wings have a dark, smoky area about halfway back along the inner margin, while the wings of the summerform are almost clear except for the veins. The dark wing patch on the winterform helps distinguish pear psylla from other psylla species occasionally found in pear orchards. Both nymphs and adults feed by sucking juice from their host. While feeding, the nymph produces honeydew, which forms into a droplet near or over it. Fifth instars, which are called hardshells, leave the honeydew droplets before molting into adults. Adults coat the honeydew droplets with wax, which prevents the honeydew from sticking to their wings. Pear psylla pass the winter as winterform adults in a state of reproductive diapause. They begin laying eggs when pear buds begin to swell. They deposit them around the base of buds and in other rough places on small twigs. After buds open, they lay eggs along midveins and petioles of developing leaves, and on stems and sepals of blossoms. Adults continue to lay eggs through petal fall. This long egg laying period produces a wide age distribution of first generation nymphs, and some complete their development before the last have hatched. Summerform adults lay eggs on terminals, and the nymphs feed on leaves and stems of tender new growth. Some first generation nymphs feed on sepals and calyx ends of fruit. There are 2 or 3 generations of summerforms before the winterform generation develops in the fall. Fruit russet: Nymphs and adults are phloem feeders. Honeydew, produced by nymphs, drips or runs onto fruit, causing dark russet blotches or streaks. This results in downgrading of fresh and sometimes processing fruit. Psylla shock: In large numbers, pear psylla can stunt and defoliate trees and cause fruit drop. A carry-over effect may reduce fruit set the following year. These symptoms, called psylla shock, are caused by toxic saliva injected into the tree by feeding nymphs. When psylla are controlled to prevent fruit russet, psylla shock does not occur. Pear psylla also transmits a mycoplasma disease organism through its saliva. The disease damages sieve tubes in the phloem, which prevents synthesized nutrients moving down the tree and results in root starvation. Diseased trees may either decline slowly or collapse suddenly and then die. Trees suffering slow decline can recover if psylla density is low. The severity of the disease depends on the origin of the rootstock. Cultivars grafted onto Pyrus pyrifolia or Pyrus ussuriensis are more susceptible than those with Pyrus communis roots. Resistant rootstocks have helped remedy the problem. It is important to monitor psylla carefully throughout the growing season in order to detect increases in populations before they reach damaging levels. Adults: Adults are monitored by jarring them from limbs onto a white cloth tray and counting them. Hold a tray, 18 inches square, under an almost horizontal section of limb that is 3/4 to 1-1/2 inches in diameter and has an average complement of branches and spurs. Tap the limb firmly three times with a 1-foot length of stiff rubber hose. Old spray hose works well. Adult psylla jarred from the tree cling to the cloth and can be counted. Remove insects and debris from the tray by turning the tray upright and tapping it lightly with the hose. A standard sample consists of 25 beating tray counts taken at random throughout the area surveyed. 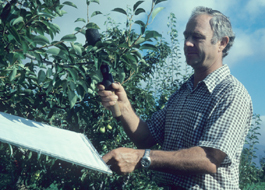 Emphasize sampling in parts of the orchard with a history of high populations. Nymphs and eggs: To determine the density of first generation eggs and nymphs, carefully examine new growth on spurs. Collect at least 10 fruiting spurs at random from the area being sampled. Horizontal or upward pointing spurs are best. Count eggs and nymphs on each leaf, fruit and stem with a dissecting microscope or a 10-power hand lens. Subsequent generations of eggs and nymphs should be sampled on new shoot growth. Pick at least 50 leaves from randomly selected shoots throughout the area being sampled. Take equal numbers of leaves from near the tips and the bases of shoots. Examine them as above. As with adults, concentrate sampling on parts of the orchard most damaged by psylla in the past. As populations of psylla increase rapidly on highly vigorous trees, avoid practices that overstimulate tree growth. Apply only enough nitrogen fertilizer to achieve adequate fruit set and good fruit size. Prune trees moderately each year, rather than lightly for a few years and then heavily to correct tree size and shape. Irrigation through overtree sprinklers will reduce fruit russet by removing honeydew from leaves and fruit but should be used cautiously as it may encourage development of diseases. Pulling off water sprouts or suckers growing from scaffold limbs through the center of the trees not only removes tender foliage that psylla feed on but also allows sprays to penetrate better. Pull water sprouts by hand, rather than cut them with loppers, to minimize regrowth. This should be done before sprouts develop woody attachment to limbs, normally before the end of June. The best approach to chemical control is to destroy winterform adults before they lay eggs. It will take 2 or 3 pre-bloom sprays to accomplish this. Apply the initial dormant spray as soon as adults begin to lay eggs. Female winterform adults can be dissected to monitor egg development in the ovaries. Eggs turn yellow when they are almost mature and about to be laid. Monitor surviving and immigrating adults after spraying. Spray again at delayed-dormant or clusterbud stages, or both, when density exceeds 5 per 25 trays. The risk of reinfestation can be reduced by coordinating spray timing with neighbors. Oil, in place of or combined with the first pesticide application, delays egg laying by winterform adults until green tissue appears on developing buds. This delay helps to synchronize egg hatch, which makes subsequent sprays more effective. Sprays after petal fall are usually needed to keep populations below damaging levels through the growing season. Monitor nymphs as above and treat when density exceeds 0.3 per leaf. 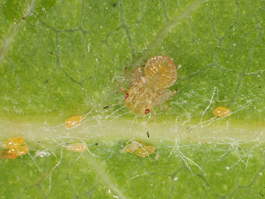 Sprays are more effective if applied when most of the nymphs are in the first three instars rather than later instars. Pesticides applied to pears greatly reduce the effectiveness of natural enemies. Soft pesticide programs that spare natural enemies would reduce the need for chemical control of pear psylla and other pear pests. Soft programs have been researched but not implemented due to the lack of registration of suitable selective pesticides.